It’s been a little while since I posted on here regarding my painting endeavors… There’s been a lot going on, since my last WIP update, like moving to the Netherlands, starting a new job and generally restructuring my entire life. So I wanted to post a little update showing what I’ve been working on. 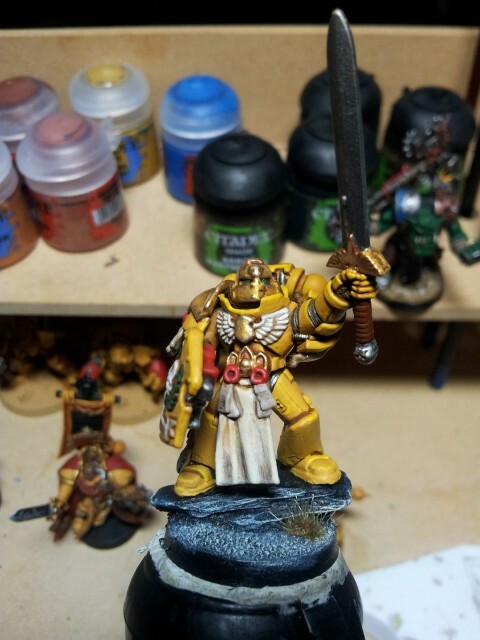 Recently I had the idea that I wanted to paint some models, just for the hobby of it, with the intention of placing them on the desk of my new Dutch workplace. I had some trouble thinking of a theme, so I settled on the idea of having one character from each army that I collect. These armies are of course Orks, Space Marines, Necrons and soon to be Chaos Space Marines (As I’m getting the new box set, more on that later). I’ve been really busy the last few months so I’ve not had a lot of time for hobby, but I thought I’d ease myself back into it and try some new techniques on 2 models, this time specifically to go on my desk. I have plans to do a 3rd, being a necron of some kind, but for the moment, these 2 will be it. In the first pic, you can see both models, being a Imperial Fist Space Marine Company Champion and an Ork Nob with Big Choppa. 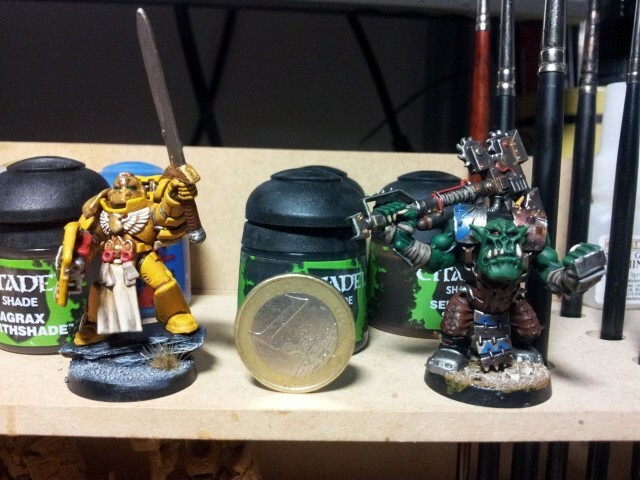 I added a euro because some people have asked me what the size of the models I paint are, so it’s just there for scale. The other 2 pics are just close-ups of the models. Things to highlight are that I’m making a lot more effort with my basing this time, being the rock and Citadel tufts on the Champions base. This is also the decided hue of the basing for the rest of my Fists army. I like the blue tone, which was very easy to achieve (Major plus). 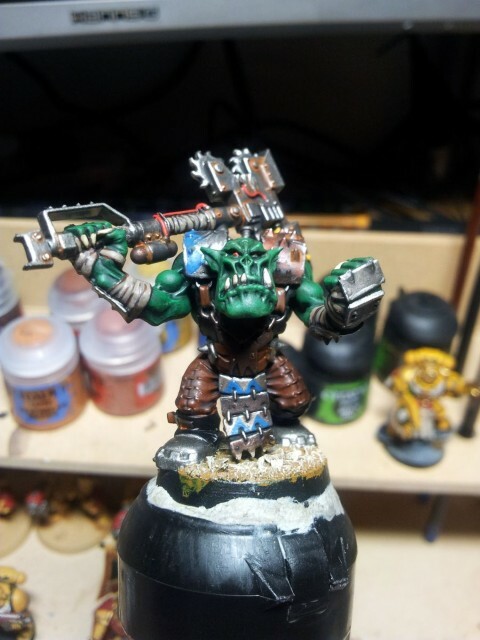 With the Nob, I spent a lot of time on the skin tones as that’s something I’ve always struggled with on my Orks. I’ve always been a quick and dirty painter, contenting myself that they look good as a group, but not so great individually. This is something I actively try to change, because I’m also a painting perfectionist and very critical of my own work, which I feel also drives me to improve with each model and ‘failure’. I very happy with the the rusty effects on the Nobs armour and Big Choppa, this was kind of an experiment to see how it would turn out. I think the model looks great, even though I think it doesn’t look great in the pics (Taken with my phone late at night under my painting lamp. Not ideal lighting). Now, what was that tasty bit about the new box set, and something about Chaos Space Marines?